Keep an inventory list with your shade parts and check that you have ALL your parts while packing and again during the dis-assembly. Bring all tools necessary for assembly and stake removal. Do an internet search for rebar stake removal techniques prior to leaving for the playa. Something to stand on. A sturdy chair or cooler will do for some, shorter folks may need a ladder. Vice grips, rope, or whatever you require for your chosen re-bar stake removal method. 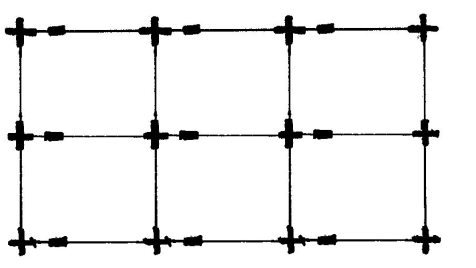 Place all roof poles on the ground next to corresponding fittings as shown. Connect all roof pipes and fittings. Make sure to place all five-way fittings with the vertical extension facing down. Tighten eye bolts gently with a tool. Do not over tighten. Lay tarp over assembled roof frame. Start by attached the tarp corners to poles with ball bungees*. Use two ball bungees at each corner, one for each pole. Once corners are fastened, use a ball bungee at every grommet to secure the tarp. *To use a ball bungee, push elastic through grommet and pull until the plastic ball is resting against the tarp. Loop elastic around the poll and back over the plastic ball. This step is best done with 2-3 people. Lift one side of the roof and insert leg poles into the fittings and tighten eye bolts. Lift the opposite side of the roof and insert remaining leg poles and tighten eye bolts with a tool. Make sure the legs are even and straight. Drive re-bar into the ground about 4″ to the same side of each leg. 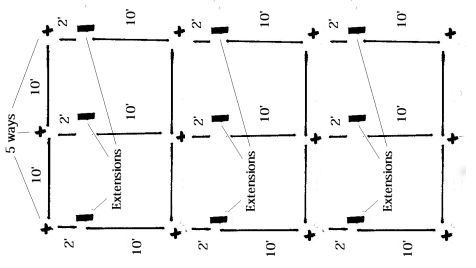 The 24″ stakes should be driven straight in until about 7″-9″ of the re-bar remains above ground. Once all stakes are driven, lift one leg, inserting the re-bar into the pole. Tighten the bolt to the re-bar, then tighten the lock nut against the welded nut attached to leg. This will keep the bolt from jiggling loose. Repeat with remaining legs. Blackrock Hardware shade is great for what it says: shade. However, in the rain, the flat roof will collect water. If this happens simply tip the water off the roof tarp with a broom handle or cut a small hole in the center of each 10′ quadrant for drainage.